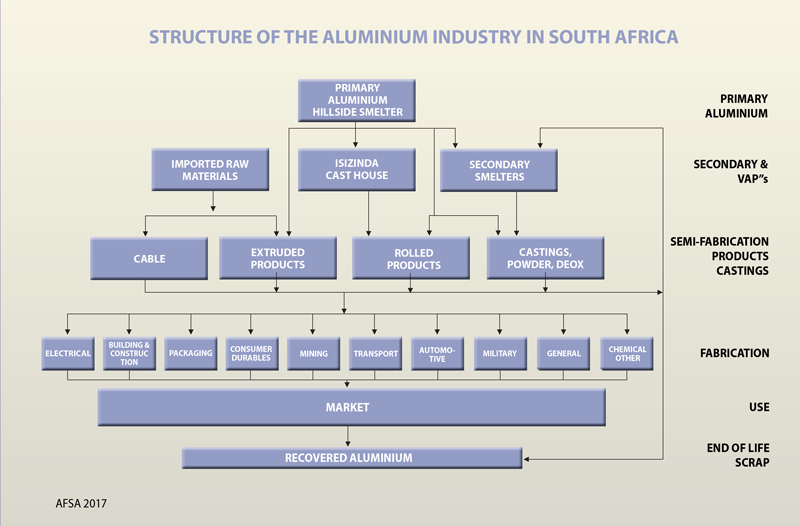 The South African Aluminium industry is one of the industrial pillars of the South African economy. Along with the economic impact and contribution to the fiscus, the industry generates significant foreign exchange revenues and provides an estimated 11 600 employees in the sector with decent jobs. The multiplier effect takes the number to 28 900, and dependencies to 55 700. Manufacturing of aluminium products and components play a vital role in the architectural, building and construction, automotive, transport, consumer durable, electrical, packaging, chemical and explosives and general engineering sectors. Growth in the South African use of aluminium in automotive and packaging applications has been impressive in recent years. Before discussing the industry, it is pertinent to briefly discuss aluminium and its alloys. “Aluminium” is a generic term for a group of alloys (wrought and cast) that are characterised by their chemical composition. There are eight active alloy groups for wrought alloys and five for casting alloys. The behaviour in service of these alloys depends on the composition, hardness and temper. There are both heat treatable and non-heat treatable alloys. Careful selection of the most appropriate aluminium alloy and its condition is critical to success in any application. Details of the alloys and their best application are available from the Federation and from the suppliers. AFSA is able to advise on properties, design criteria, corrosion resistance, machinability, formability, weldability and surface finishing of all common alloys. 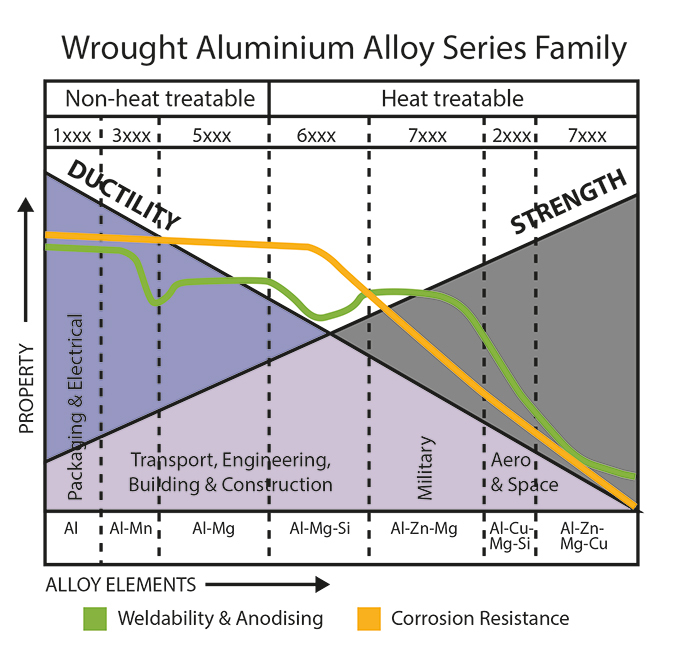 (see the diagram “Wrought Aluminium Alloy Series Family). Aluminium is an element (no 13) and can be recycled indefinitely without loss of metallic properties. Off cuts, waste, dross and end of life scrap are all capable of being recycled by remelting. This is performed by the secondary smelters, but also by the producers of semi-fabricated products, some foundries and dross processing plants. Melting aluminium requires 5% of the energy used to produce primary aluminium. Aluminium’s recyclability, low melting energy and light weight characteristics are fundamental to the metal’s sustainability, and GHG emission reduction potential. 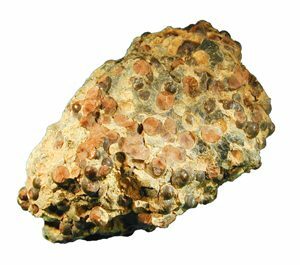 The aluminium supply chain commences with the primary smelters producing 99.7% pure aluminium from alumina, found in nature as Bauxite. The first smelter constructed in Richards Bay started producing primary aluminium in 1971. Output was about 35 kt and was driven by import substitution. Usage of aluminium products increased rapidly and production was increased in the mid-seventies as demand rose (see graph). With excess electricity generation capacity available it was decided to build the Hillside smelter. Total production is of the order of 720 kt p.a. of which about 500 kt is exported. During 2014 BHP Billiton (today South32) decommissioned the Bayside Smelter in line with the Government’s requirement that industry reduce electricity demand by 10%. (Pot line B had already been closed earlier). The Bayside cast house was purchased by Bingelela Capital and Hulamin Ltd. Currently only rolling slab is produced by the renamed Isizinda Cast House, with feasibility studies to reopen the extrusion billet, redraw rod, rim alloy and other production facilities. 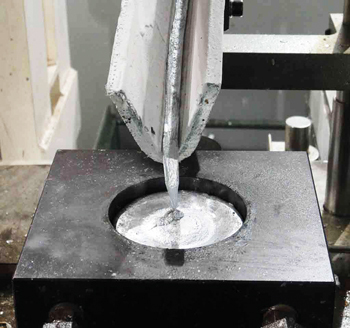 Produces tailored remelt ingot using aluminium scrap and primary metal. This is the main feedstock of the aluminium foundries. Metallurgically the products produced by the local secondary smelters compete with the best in the world. The secondary smelters also manufacture powders (used in explosives, flocculants and personal care products) and deoxidants for the steel industry. When used in those applications the aluminium loses its metallic properties and is lost to the recycling value chain. The Castings industry engages in a range of sectors. The largest of these is the automotive industry accounting for some 91% of production. The balance of the castings are used in many and varied applications. These include architectural, art work, lighting, consumer durables, structural and electrical applications. Foundries have faced various pressures, largely brought about by globalisation, and the OEM’s purchasing decisions made outside of South Africa. Low cost imports, modest volumes, rising energy costs and the high price and often poor quality of aluminium scrap have contributed to the large number of foundry closures. Those foundries that have survived have identified niche markets and have learnt to be both effective and efficient. With it has come the ability to compete in both local and export markets. The National Foundry Technology Network (NFTN) has provided extensive support to casters in South Africa. The Department of Trade and Industry (the dti) identified the metal sector and foundries in articular, as focus areas for support in the Industrial Policy Action Plan (IPAP). The NFTN is an initiative of the Department of Trade and Industry (Dti), and is managed by the Technology Localisation Implementation Unit (TLIU) of the CSIR. The Semi-fabricators convert rolling slab, extrusion billet and redraw rod into flat products, extrusions and wire (cable) respectively. It is important to understand this step in the aluminium value chain, which differentiates aluminium from steel production, where steel production and rolling are often an integrated process. Aluminium sheet and plate products (FRP) have been manufactured in South Africa since 1949 at Hulamin Ltd’s sites in Pietermaritzburg. From small beginnings, with a single stand hot mill, the company has evolved into a leading aluminum semi-fabricator. In addition to supplying the South African market, Hulamin supplies a diverse range of international markets in North and South America, Europe, the Middle and Far East. Current installed capacity is 250 000 tpa with recent production levels of around 200 000 tpa, of which about 60% is exported. The focus is on specialised product and end-use markets, including foil, can sheet, engineering plate and automotive products. Hulamin sources rolling slab from the Isizinda casthouse which is supplemented by slab produced in their in-house remelt casthouse using ingot from Hillside, scrap from the market and runround scrap. 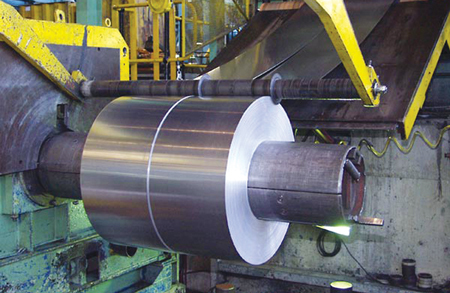 Predominantly, hot-rolled coil is produced, supplemented by continuous cast coil. Hulamin can supply most of South Africa’s rolled product requirements for the engineering, automotive, building, transport, packaging and other industries. A significant increase in demand for FRP has been brought about by the decision to switch from steel bodied to aluminium bodied beverage cans in South Africa. The can manufacturer and Hulamin have invested significantly in this project, which has resulted in increasing demand for locally produced sheet. A key component of the project is the recycling of the used beverage cans (UBC) and appropriate equipment has been installed. In concert with the worldwide move to reduce GHG emissions by light-weighting, Daimler Benz South Africa commenced building their C-Class model which has aluminium body panels. Aluminium Body Sheet in passenger vehicles has driven global demand for rolled products. There are two major aluminium extrusion businesses and a number of smaller operations in South Africa, with manufacturing facilities in Gauteng, Kwazulu Natal and the Western Cape. They are capable of supplying almost all of South Africa’s requirements in the architectural, automotive, engineering, transport and consumer durable industries. The starting stock – cast extrusion billet – is imported and supplemented with recycled material by the two major extruders in their in-house furnaces. Extensive regional facilities exist which can produce powder-coated and anodised finishes – largely for the architectural market – to international technical and quality standards. AFSA has been actively promoting recognition of such standards to protect the integrity and reputation of these products and encourage the use of local applicators. Is where value is added to semi-fabricated products and castings, producing components and products ready for use by other industrial sectors, or directly by consumers. Applications for rolled products and extrusions are found in architecture, in architecture, construction, automotive, marine, transport, mining, packaging, electrical, foil applications, military, aerospace, aircraft, chemical plant, consumer durables, art and sports. 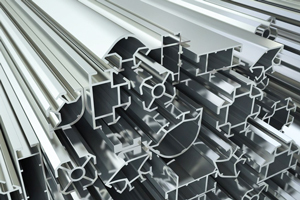 The applications of aluminium are far too numerous to be detailed and bear testimony to the versatility, formability, weldability and corrosion resistance of aluminium. The Service Sector includes Surface Finishing, distribution and testing and engineering services. Surface Finishing performed by AFSA members include anodising, powder coating and coil coating. The South African aluminium industry has a well-developed export market for aluminium ingots rolled products and forgings, castings and finished products. This has entailed building marketing networks, and achieving internationally recognised quality standards and price competitiveness. The industry has focused on its competitiveness, cost control, investment in plant and equipment and innovation. As such it is well positioned to benefit from the forecast growth in demand for aluminium rich products both locally and internationally. Two major studies of the industry and its growth potential were undertaken in 2016. “A doubling in demand for aluminium and a doubling of direct employers is possible if a number of key issues identified are addressed. We are pleased to feature activities undertaken by the industry that include investment in both plant and equipment, but very importantly in training and development of human capital. Transformation is vital for the long term sustainability of the industry. Again the industry proactively introduced programs to support entrepreneurs interested in entering the aluminium value chain.